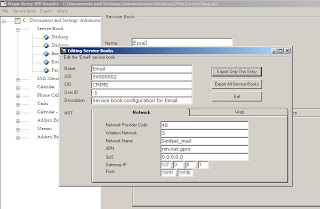 IT-manager's Life (English): How to Print the SMS of BlackBerry? Who owns a BlackBerry Phone can connect it via USB port (with the appropriate cable) to his PC and can use the Desktop Manager Software supplied to perform the backup of all the data present in his phone directly to his computer. The result is a single file with the extension .IPD containing: Contacts, SMS, Dialed and Received Calls, etc.. However, they are NOT directly readable or accessible! Magic Berry of Mena Step Innovative Solutions in version 3.5.0 is free, but registration is required at the site (free) to download it. In addition, for each of these items you can export the data as a .CSV (Comma Separated Value) , readable by Excel / OpenOffice to print them later. "MagicBerry Version 3.5.0 can convert between IPD and BBB files (unencrypted, with NO password). It will be very easy to work between BBB files for windows and Mac desktop manager. and still we are working on many others...."